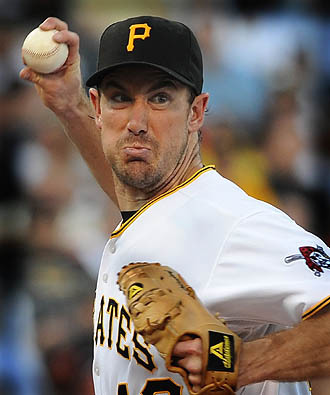 The Pittsburgh Pirates dropped their 11th in a row on Thursday night, losing 5-4 to the Chicago White Sox at PNC Park. So much for the secret extensions being announced to inspire the team. Pedro Alvarez went 0-for-4, striking out thrice and grounding into a double play, becoming a True Pirate in the process. As for the rest of the Bucco offensive attack, Neil Walker, Andrew McCutchen, and Lastings Milledge each had two hits, with Walker hitting his second home run of the season. Ross Ohlendorf allowed nine hits and five runs in 6 1/3 innings of work, running his record to 0-5 and looking every bit the part of the annual Pirate pitcher who's taken one step forward and two steps backward. It had to be someone, and Mr. Wonderful has stepped up nicely. The Pirates are winless since June 5 and sport a record of 2-12 for the month. This is their longest losing streak since a 13-gamer in 2006 and their second-longest in 55 years, as the 1955 Pirates also lost 11 in a row. They are 0-6 in interleague play this season. Shall I go on? Surely, the next person I approached would be pumped for Pedro-palooza, even if the Buccos had lost nine straight. But I swear this is what Mike Biosko, a middle-aged man from Cranberry, told me when I asked if he and his buddy had come for the Alvarez unveiling. "No, we're here to see if they lose 10 in a row," he said. Big East commissioner John Marinatto sent 10 red roses, 10 white roses and a card that simply read, "Unity" to Big 12 commissioner Dan Beebe this week after his conference salvage job. DeJuan Blair will host his first basketball camp July 6-9 at Robert Morris University in Moon Township, PA. The camp is for girls and boys ages 9-18, and will run daily from 8:30 a.m. – 4:00 p.m. Throughout the camp, participants will participate in lectures, basketball drill stations, player evaluations, 5 on 5 games, basketball contests, and educational sessions. The camp is open to girls and boys ages 9-18 and will cost $199 per camper, which includes a Nike t-shirt, photo with DeJuan Blair, awards, and instruction from some of the top coaches in the region. For more information on the DeJuan Blair Basketball Camp, please visit www.DeJuanBlair.com or www.DeJuanBlairBasketballCamp.com, email info@five-starbasketball.com or call 914.373.0068.